Discover the incredible lifestyle that comes with country living just minutes from downtown! Fall in love with Croasdaile Farms homes for sale below! Located in north Durham, this master-planned residential community provides fantastic living with explicit architectural and community standards to ensure the rural feel and natural beauty of the area is preserved. Home to over 300 families and counting, Croasdaile Farms homes for sale are ideal for the growing and established family that is looking for a home away from the hustle and bustle of the city center. Originally a prosperous working dairy farm, Croasdaile Farms is quickly becoming one of the most desirable communities in the Durham real estate market and is highly sought after among even the most discerning of homebuyer. View all of the current homes for sale below or keep reading to learn more about Croasdaile Farms real estate and the lifestyle amenities nearby. 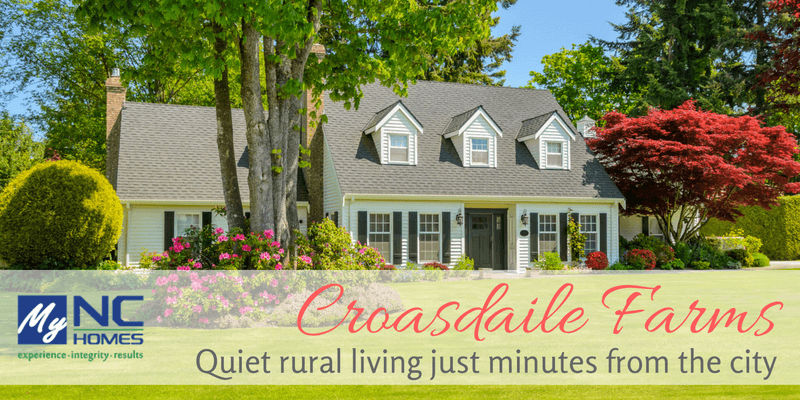 Croasdaile Farms real estate offers homes in a variety of size, style and priced point that is sure to please virtually every type of home buyer. Featuring spacious single-family detached homes, well-appointed townhomes and contemporary apartment style condos, Croasdaile Farms has a property for every lifestyle requirement and offers the serenity and quietude that can only be found with country living. Detached family homes in Croasdaile Farms are the most popular choice among families looking for a close-knit community and a home that will comfortably house their growing family for years to come. Featuring spacious floor plans, classic layouts and stunning architectural styling, these homes offer timeless appeal with incredible craftsmanship and high-end materials. Ranging in size from just over 2,000 square feet to almost 8,000 square feet with lots that can approach 2-acres in size, there’s an abundance of room for entertaining, family gatherings or just enjoying the tranquility and privacy that comes with a well-designed home. For those home buyers that require less space and desire a low-maintenance lifestyle, Croasdaile Farms townhomes and apartments offer cozy living with luxury appointments in the heart of the community. Featuring spacious floor plans, large windows that provide an abundance of natural light, care free maintenance and weekly housekeeping, these luxury apartments are ideal for those that desire high-end living without the upkeep of a larger property. As one would expect from such a well-planned and well-maintained community, Croasdaile Farms properties are set among gorgeous landscaping that fits in seamlessly with the lush, mature forests and rolling grasslands. The extensive paved path system that meanders throughout the neighborhood promotes an active lifestyle and is regularly used by residents for walking, jogging, cycling and just exploring the amazing greenspace, lakes and forests that adorn the community. For the best shopping, dining, entertainment and professional services, residents of Croasdaile Farms properties are only minutes from the commercial and retail along Hillsborough Road and the various shopping malls that can be found in the nearby communities of Walltown, Duke Homestead and Downtown Durham. To learn more about Croasdaile Farms real estate and to request a showing, contact the team at My NC Homes today! Send them a message online or give them a call at 919-659-6173.